I've got a super-fun guest post for you today! 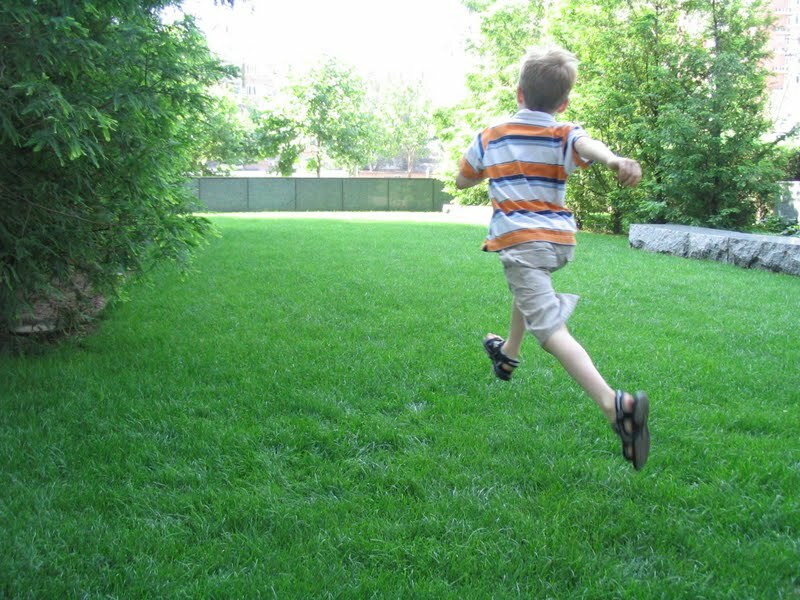 ... An outdoor obstacle course from Amanda over at Gratefully Growing in Grace, perfect for summer fun and beating that holiday boredom! My name is Amanda and I’m so excited to be writing a guest post for Mama Pea Pod. I’m visiting from Gratefully Growing in Grace where I write about baby, toddler, and preschool activities, craft and sewing projects I manage to squeeze in, recipes I love, and as any good mommy blog includes, cute stories, photos, and videos of my children. I have a 3 year old son and an 11 month old daughter who are spectacular and I try to be an equally spectacular mommy. Obstacle courses are one of my favorite activities to do with the kids, probably because I remember doing them when I was a kid myself and having a lot of fun. I began doing simple obstacle courses with my son when he was just over a year and starting to learn how to follow simple directions. We often set up obstacle courses in the house during the winter and do things like crawl, slither, climb under things, put a puzzle together, match toy pairs, play instruments, and build a block tower as we race against the clock to get the fastest time. We also like to do them at the playground and do things like go down the slide X number of times, swing X number of times, run between point A and point B, and so on. This summer has been our first go at a backyard obstacle course and so far it is a smashing success. With some cooler weather in our area recently (after temps boiling near 100), we have gotten to play in the back yard numerous times to try it out. The main goal for the obstacle courses we set up is to have fun while burning lots of energy. An obstacle course is also good for following - and remembering - simple directions plus practicing a variety of skills. We do four or five tasks per course, run through it a few times, then change it if we feel like it. For some reason, my son doesn't care about racing against the timer in our backyard course so we don't worry about that. We just do a lot of cheering each other on. We also kick the soccer ball at the net to score a goal, use the batting tee until we get X number of hits, push the toy lawnmower X number of laps, and so on. We basically use all of our outdoor toys and games and tie them into a certain obstacle course sequence. I ran through a couple of our courses with my daughter in my arms. She laughed the entire time - it was a bumpy ride. She'll be walking any day now and maybe we'll get her to do some two task courses, or maybe she'll be content watching the fray and laughing. Either way, our obstacle courses are fun for all the ages in our family. I'd love to hear what other challenging, silly, or imaginative obstacle course tasks you use with your children! Thanks so much to Amanda for guest posting and sharing this fun idea with us! What a great way to expend excess energy while learning to follow multi-step directions at the same time! I will definitely be using this in my EAL classroom (or maybe out on the playground as my room is rather tiny!) as well as at home with my own two little peas! Fun, fun! If you haven't checked out Amanda's blog, Gratefully Growing in Grace yet, be sure to go over and visit! Check out her fun homemade I-Spy books, or her Monkey Finger Puppets for starters.